I didn't want to hammer fence staples while standing on a ladder so instead I drilled small holes on the top corners of the 4x4's that can fit 16 gauge wire through to attach the top fence layer. We went to visit my mushroom compost mothers-in-law last weekend and were stunned by the growth of their cucumbers from one month to the next. The only downside of this kind of exuberant growth is the difficulty of finding the fruit. 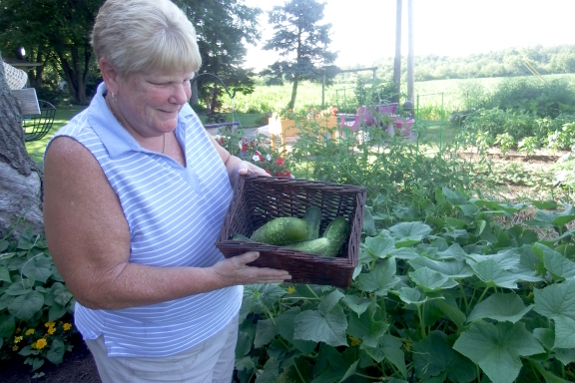 "The vines look beautiful," Rose Nell told me, "but there's only been one cucumber big enough to pick." "Are you sure?" I countered. I got down on my knees and peered into the cucumber monster. Soon, our basket was full of crunchy fruits. The new clothesline only took about 20 minutes to install and gets good sun. 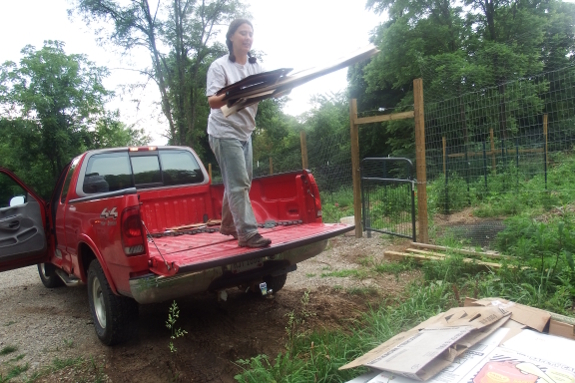 My current plan is to use a layer of cardboard covered by a layer of wood chips for a perimeter pathway around the inside of the garden fenceline, combined with a layer of cardboard covered by a layer of compost for a flower/berry/undecided bed around the outside of the garden fenceline. Of course, this lofty plan depends on lots of cardboard, wood chips, and compost. We'll see if the supplies and/or my back give out before the kill mulch is complete. If so, we might follow other readers' suggestions and burn the weeds off instead. 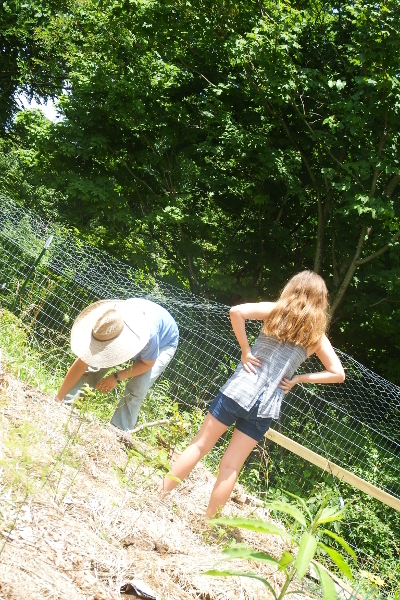 Stretching the top 2 feet of garden fence to complete an 8 foot section. 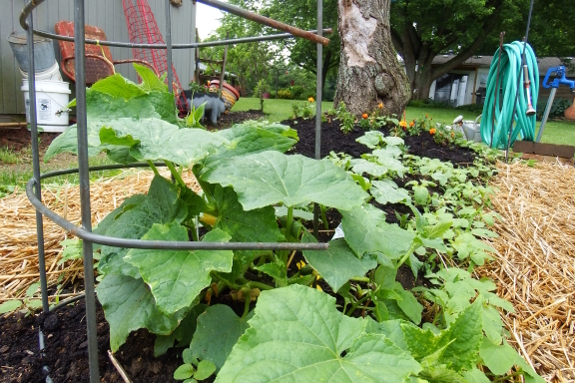 It's astonishing how much the garden grows now that the deer can't enter to dine. 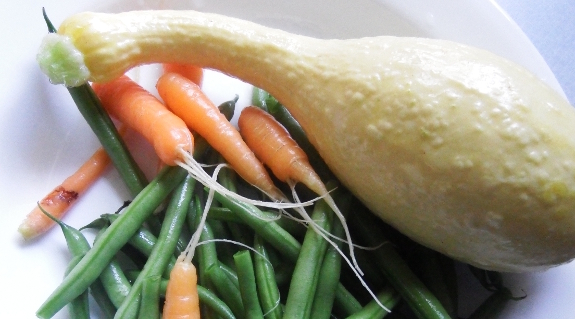 Without errant nibblers, we're now growing half of our daily veggies. Summer squash, green beans, eggplants, and baby carrots are already on the menu, with tomatoes and cucumbers slated to come in any day now. On the deer-pressure front, I'm now guessing southeast Ohio has about twice the population as southwest Virginia. No wonder the serious gardeners around me have perfected the Fort-Knox-style fence. How is the Honda mower working out in the new location? We are still happy with it. The self propelled feature continues to be my favorite part. The manner in which it engages is better than all the other self propelled mowers I've used in the past. Thursday afternoon, Mark and I stocked up on biomass. 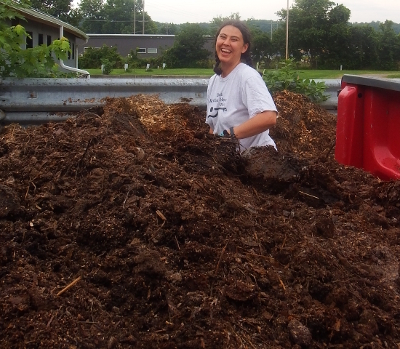 We snagged as many cardboard boxes as we could fish out of the recycling dumpster, unloaded that, then filled the bed halfway up with horse manure. 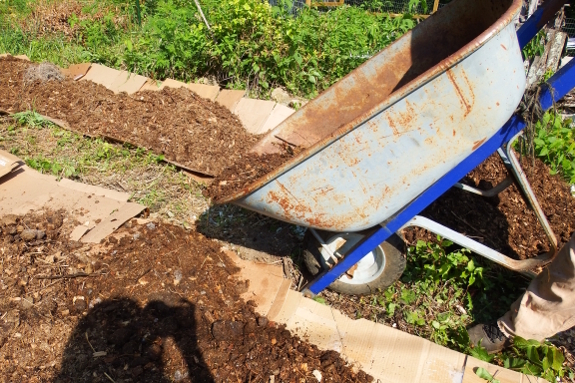 As of Friday lunchtime, every bit of the manure and most of the cardboard was already used up. But I've got two big rows just waiting for strawberry plants! 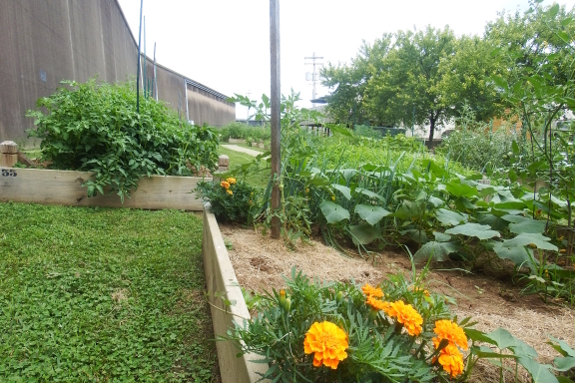 The Parkersburg community garden sits right next to a giant flood wall. It was built in 1950 with a gate that can be closed in case of really high waters. According to google it has never needed to be closed. 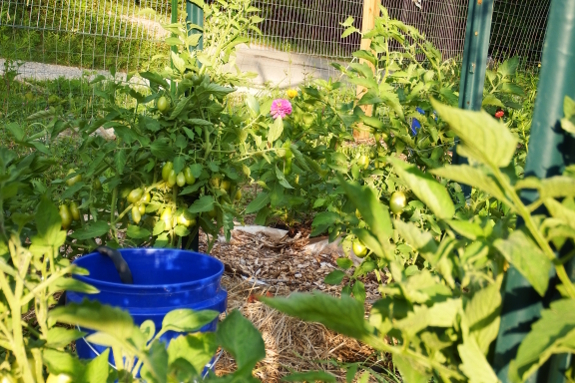 You're probably aware that tomatoes won't set fruits when temperatures exceed 85. 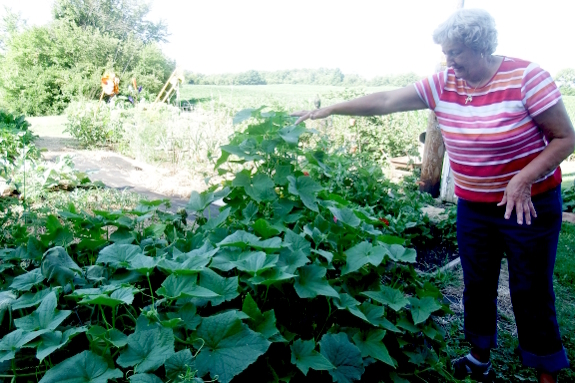 But did you know that summer squash can be equally sensitive to wild weather? Mark and I have been eating summer squash for a week or two now, and I only realized that was a fly in the ointment when I went to show off flowers to the neighbor kids. "Can you tell which ones are females?" 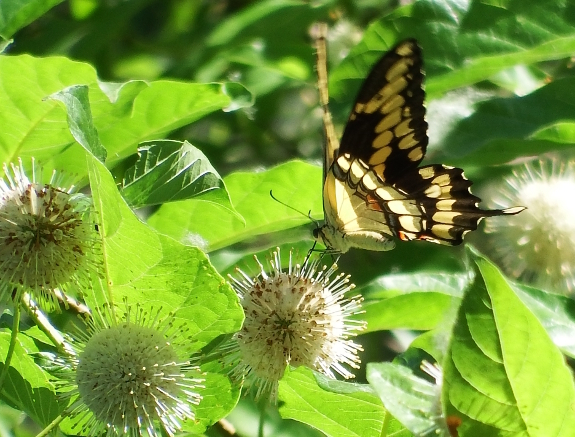 I asked...then furrowed my brow as I realized there were almost no female flowers currently present on my plants. While it's perfectly normal for squash plants to open lots of male blooms and no females as they're maturing, after that I'm used to seeing at least as many females as males. However, we've had really hot weather recently and I've only been watering plants that appear to need it (not the squash). Apparently that stressed the plants enough to make them abort most of their female fruits. I've now added squash back into my watering rotation, and will hope that's enough to put their offspring back on our plates. 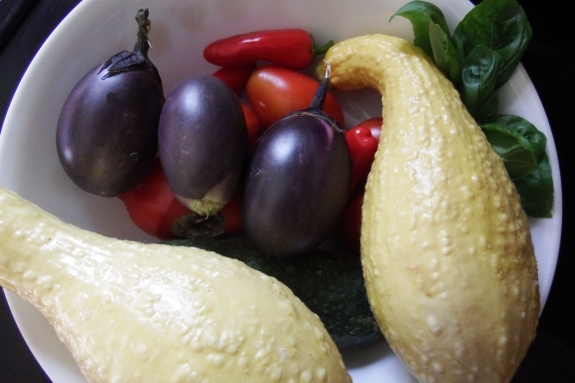 I'm sure we'll be sick of squash by autumn, but for now it's a treat to harvest each ripe, yellow fruit. We attached a garden hose hook up point to our washing machine intake. Anna and I have a debate about hooking up the dryer. She is fine with not hooking it up....I want to have it available on cold rainy days when we don't want to hang clothes outside. It might take me a while to win that one. Meanwhile we will use the dryer vent door to access the new garden hose hook up and push it back inside when Winter comes. 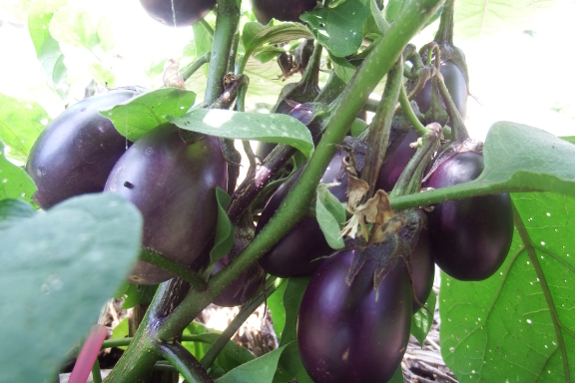 Three weeks later, it's time for a followup on my eggplant varieties post. How have Patio Baby and Black Beauty fared now that summer is in full swing? Patio Baby is both better and worse than expected. 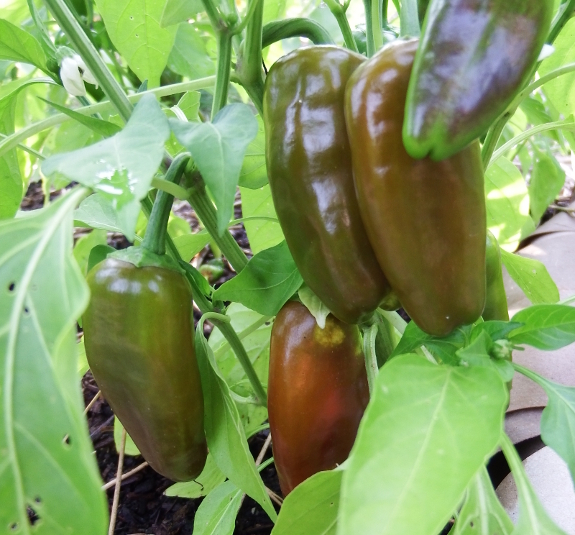 The plant is so heavily loaded with developing fruits that I had to stake the stem upright, and we've enjoyed a handful of tasty meals picked from the single plant. On the other hand, I can tell it hasn't bothered to send roots out into the surrounding soil. If I don't give it a daily half gallon of water, the plant wilts like crazy by the middle of the afternoon. My conclusion? If I had to do it all over, I would keep Patio Baby on a patio where it's easy to water and keep an eye on. Black Beauty, in contrast, is slow and sure and just now blooming. I haven't watered the plants at all except when I happen to be hitting the nearby bush beans in the same row. But Black Beauty is fine with the neglect...I'm just not sure if the plants will manage to set fruits before winter frosts come to call. Among both varieties, though, there's a major success to report on --- flea beetles haven't been much of a problem after the plants spent their first three months in pots. I always love it when a type of produce I thought wasn't worth growing organically is suddenly easy with a simple tweak, and that appears to be true in this case. Planting new strawberry plants always puts a smile on Anna's face. We haven't had any appreciable rain for a week and a half...but apparently it's mushroom season anyway. 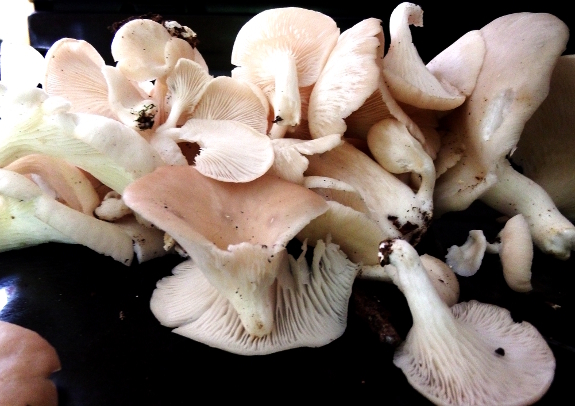 I'm guessing the cooler weather is what brought out this flush of oyster mushrooms at the park. All I know is that I could only fit a quarter of the available caps into the scooped-up front of my shirt without exposing my belly button. Clearly I need to start bringing a harvest bag with me into the woods! Our kitchen floor demanded some attention this week. Luckily the leak was easy to track down but the damage was not good. ...as are the first few tomatoes. 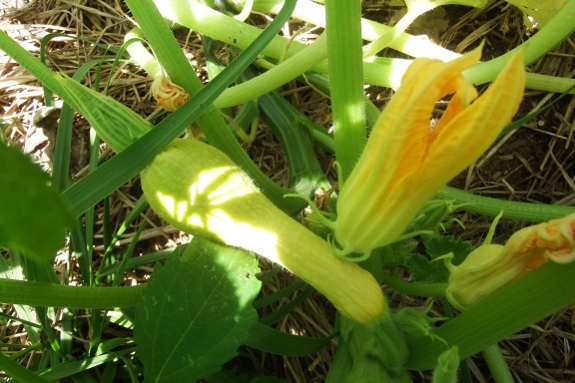 We're starting to harvest cucumbers in multiples now rather than one per week, and the summer squash are holding onto their female flowers rather than aborting them before they can turn into fruit. On the other hand, this garden is still much less turbo-charged than my Virginia one. A decade of soil building can't be replaced overnight. But blight has been minimal, the fenced acreage is perfect for keeping me sane, and I suspect I'll love this garden even more than my previous one within a couple of years. 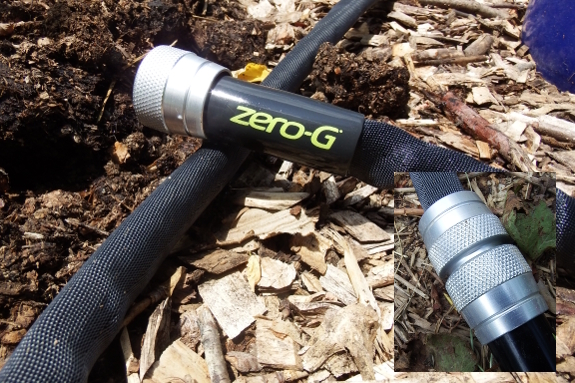 Hose technology has improved since we last went shopping. This hose looks so high-tech that Anna gave me the fish eye when I brought it home. "How much did it cost?" she demanded. After learning that the price was half of what she'd guessed, she fell in love with its light weight, flexibility, and easy connectors on either end. When we moved in here last October, I brought along some strawberry plants. With no idea where I'd later want them, I just stuck them in the ground near the trailer. Fast forward ahead to the present day, in which deer are dining like crazy on anything outside our garden fence. So rather than just transplanting runners into a new spot the way I usually would have done, I dug up every single strawberry plant. 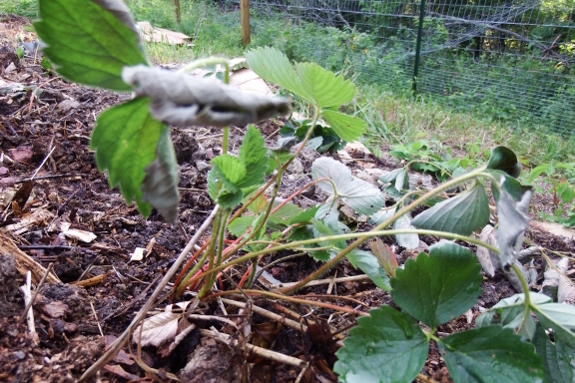 Summer-transplanted strawberries wilt like crazy the first couple of days after they've been moved. But a little water morning and evening quickly pushed ours over that hump. Some of the older leaves won't make it (and a couple of the plants similarly bit the dust). But the rest are now resilient to normal summer temperatures and should fruit for me next year. Meanwhile, I expanded the planting with twenty almost-dormant Mara Des Bois from an online nursery. Most of my favorite sources had already stopped shipping bare-root strawberries for the season, so it's possible these little guys won't fruit next spring. However, they're everbearers, so if nothing else we should taste this much-lauded variety a year from now. 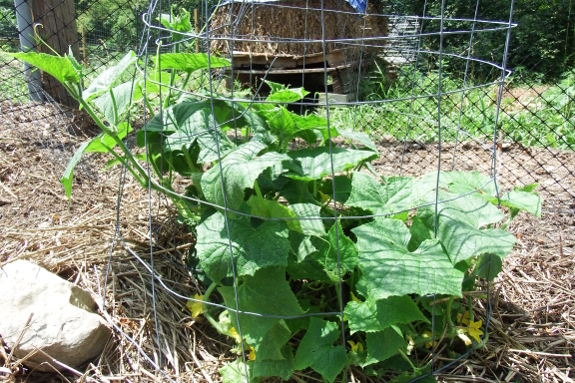 The extra bits of wire from our fence project make great cucumber cages. You know you live in a crunchy area when the free horse manure is fought over. I'm currently grabbing the precious organic matter when it's only a couple of weeks old and letting it mellow on our farm to make sure I'll have enough. 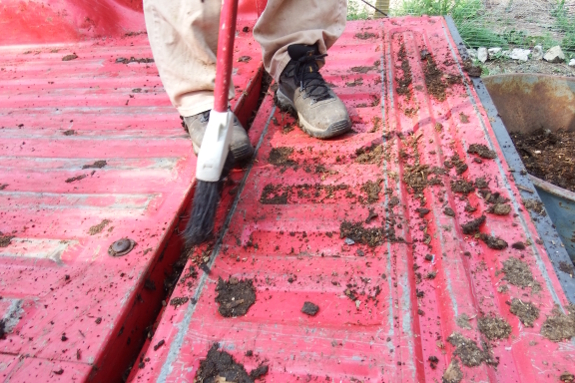 And, yes, I love my manure so much I even sweep out the truck once I'm done. 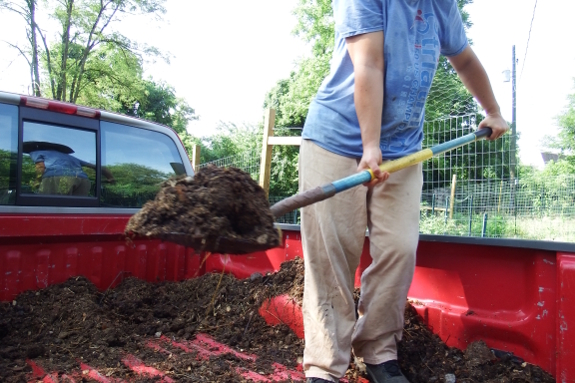 That last wheelbarrow goes a long way toward creating new garden beds! These will be planted in lettuce and kale next month. 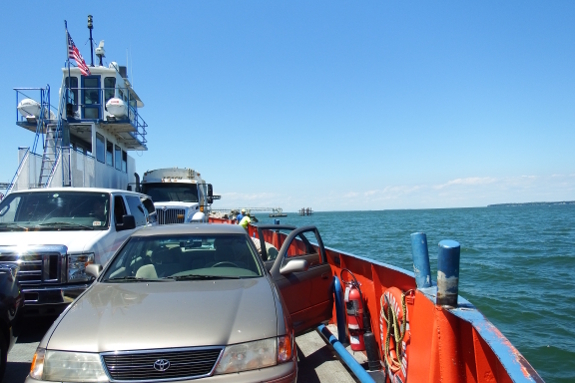 Taking the ferry to Kelleys island was a fun way to experience the western basin of Lake Erie. 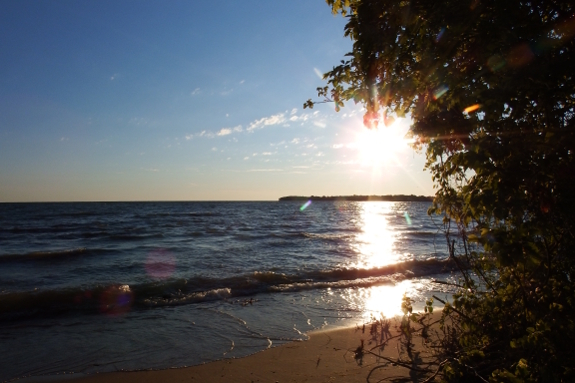 Mark and I snuck away to Kelleys Island this week, which is almost the closest spot on the Great Lakes to us and is definitely one of the most natural. I'm a bit afraid to tell you how much we loved it or the island may be swamped the next time we try to visit. On the other hand, the $72 ferry ride (two people and a car, round trip), must cut down on what would otherwise be a total inundation. Oh, but wait! There was a bit of a dud involved in this exploration. 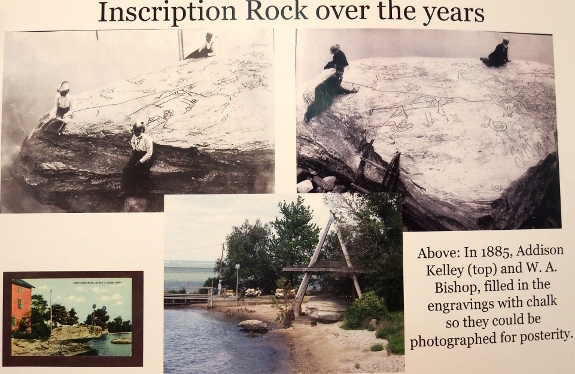 Inscription Rock, a Native American petroglyph, was pretty disappointing. The 300- or 400-year-old carvings in a big limestone boulder have pretty much worn away despite the roof erected in the 1980s. On the other hand, the history museum (from whence I stole this series of images) filled in the blanks very nicely and made me almost feel like I'd seen the original carvings. 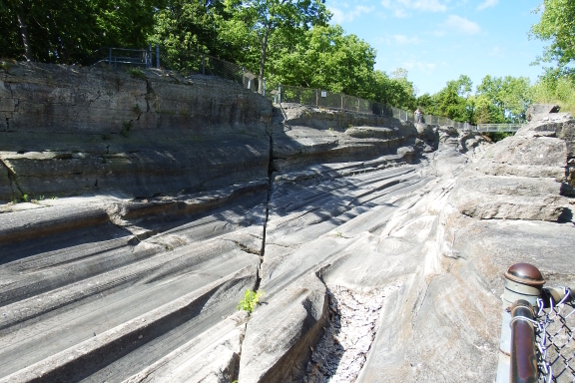 "So if glacial grooves were only your second-favorite attraction, what was your favorite part?" I can hear you asking. The North Pond Loop Trail, a nearly mile-long boardwalk through an old-growth wetland (aka an embayment pond) was so beautiful I felt like I was walking through a botanical garden...but one sculpted by nature rather than by man. There were butterflies and flowers and an out-of-the-way observation tower in which Mark and I relaxed and listened to the waves on the nearby beach while watching the world go by. Finding some place beautiful and alone to just sit is probably our very favorite vacation activity, and we indulged repeatedly. 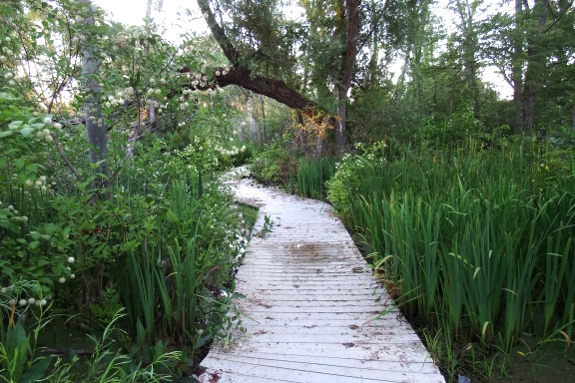 From a plant-geek perspective, the alvar on the northwest side of the island was just as amazing as the embayment pond. Also known as limestone pavement, this iteration of the ecotype looked quite different from the one I'd explored in the UK eighteen years earlier. The ocean-like Lake Erie was right there, for one thing, so the glacier-scraped rock wasn't as bare as the pavement I remember seeing inland. 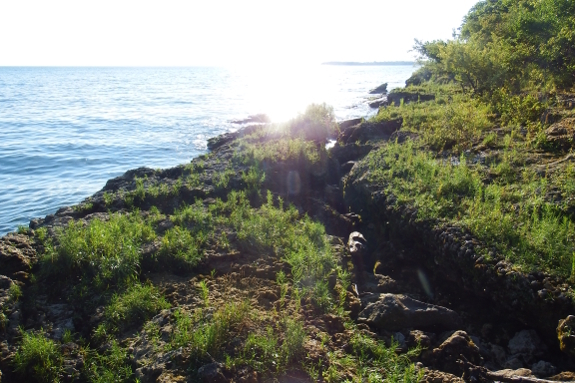 And the slap of the waves up through cracks in the alvar lent an auditory edge to the pavement on Kelleys Island that the other example didn't possess. On the other hand, those same features made the Kelleys Island alvar feel a bit pedestrian at first. What's the big difference, I wondered, between this and a rocky beach by any sea? It wasn't until I got down on my hands and knees and started peering at (and photographing) the tiny, rare flowers that barely manage to cling to the rock that I understood what makes the Kelleys Island alvar so special...and delicate. No wonder it took me two tries to actually find the habitat, which is close to but not actually on any trail. Speaking of special, I'd be remiss if I didn't mention the preserves I missed. (After all, we were only there for a day and a half, and I spent quite a bit of time lounging in the airbnb's semi-private beach.) 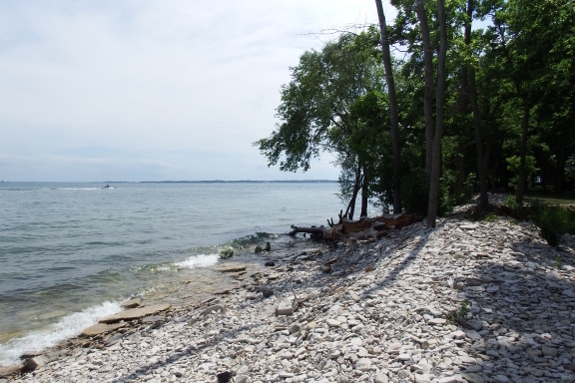 The brochure I picked up at the ferry dock's visitor center on the way out tempted me with the Huntley-Beatty Preserve for an example of a man-made alvar, the Scheele Preserve for rare rock elms, wafer ash, and citrus, and the East Quarry for fossil hunting. I guess we'll just have to go back...although I'm thinking Pelee Island might be on the agenda as well. 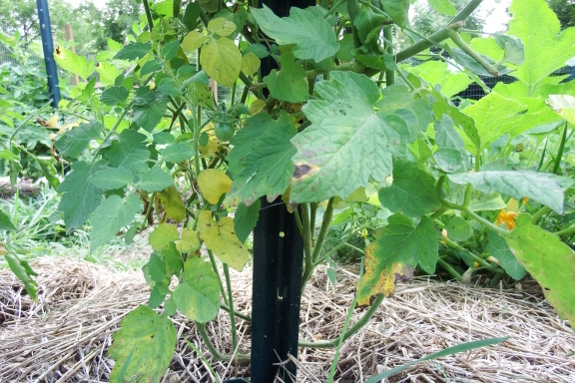 We upgraded from a watering bucket to the YardSmith watering wand. For the last ten months, Mark and I have been weekend homesteaders rather than whole-cloth farmers...and it's been fun! I just cruised through The Weekend Homesteader --- written, ironically, when I wasn't a weekend homesteader --- and discovered that we've hit 75% of my suggested projects during our first ten months on our new plot. 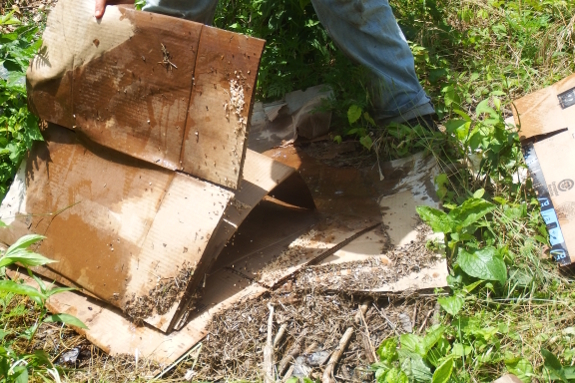 Of the projects not yet broached, I think we're going to leave chickens and bees to our neighbors for now. But I suspect rain barrels, worm bins, having enough excess food to preserve, soil testing, and at least a couple of fruit trees will be on our agenda for the year ahead. Which is a long way of saying --- this might be a two-year-project book instead of a one-year-project book, but it has stood the test of time even for its author. No wonder the title is still my non-fiction bestseller six years after publication and has nearly 100 reviews on Amazon. The Weekend Homesteader is also marked down to $1.99 today, so nab your copy now if you want to join me weekend homesteading during the year ahead! Installing a couple of shelves for Anna's closet and securing the top shelf. Just outside our main door, the bed up against the trailer faces west toward a stand of trees and barely gets any direct sun. I could have put flowers there, but I wanted to set out edibles. But what enjoys nearly full shade? 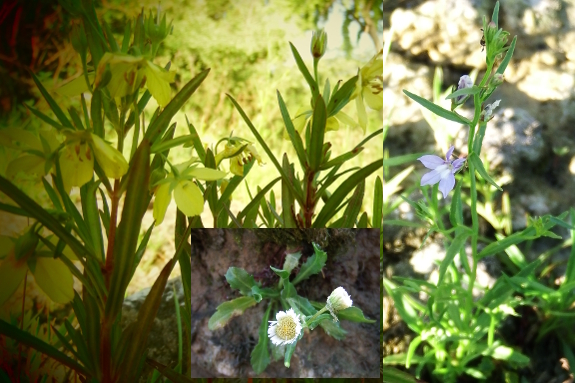 Herbs are a great choice for this kind of situation since they often get too strong-flavored/bitter under the peak summer sun. 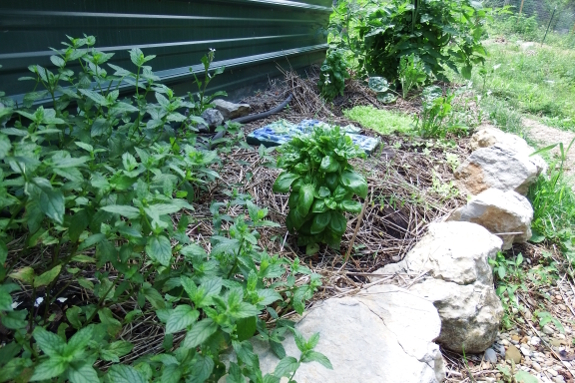 Both the mint and the basil in this bed grow slower than their compatriots in the main garden, but they taste a lot better at this time of year too. An ultra-early lettuce bed is another good solution. In fact, my mid-July planting is doing so well, I'm thinking of setting out some spinach seeds while the ground is still wet and cool. How about you? What edibles have you installed in shady locations in your garden with good results? Liquid Nails is one of my favorite building products to fill in small gaps. 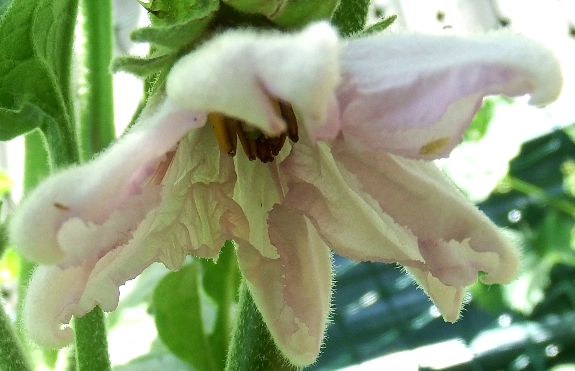 We had a rainy week here in Ohio, and suddenly all of the gardeners started talking about tomato blight. Unfortunately, I've seen a lot of misinformation floating around in that department. So this post is my attempt to debunk a couple of myths. 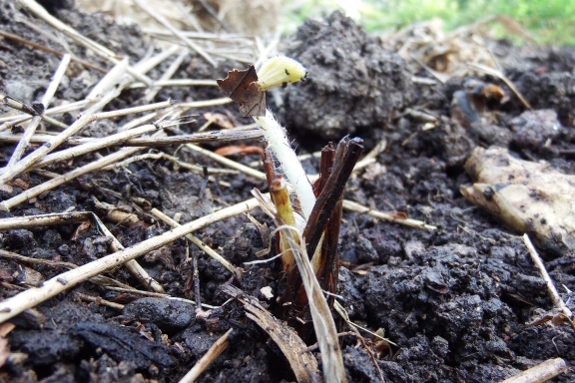 Myth 1: Blight came in with my compost. While it's possible that you brought in tomato blight in one of your store-bought supplements, it's most likely this fungal disease floated through the air from someone else's garden to yours. 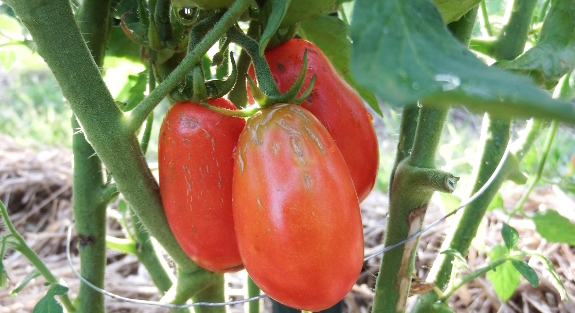 Store-bought tomato plants can sometimes bring blight along with them. But unless the compost you bought was created from diseased tomato plants, it's unlikely a soil amendment is at fault. 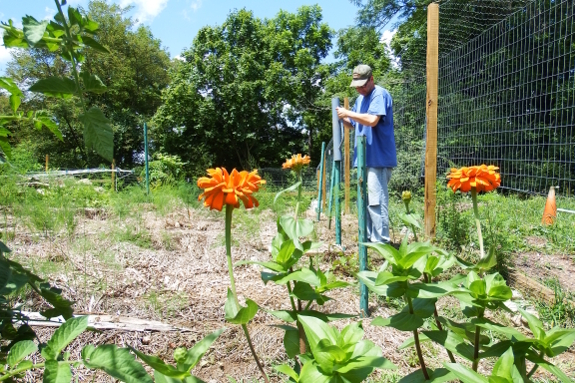 Myth 2: I'll plant African marigolds and beat the blight that way. Tomato blight refers to one of several different fungal diseases while African marigolds are used to combat some species of nematodes. 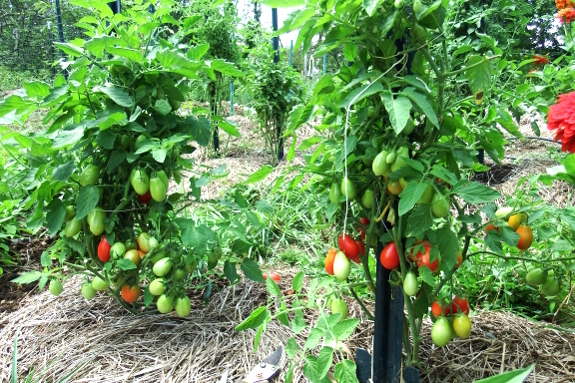 Tomatoes can (rarely) suffer from nematodes, in which case you'll see enlarged knots on the roots, yellowing leaves, and general slow growth. So, sure, plant a cover crop of African marigolds in next year's tomato bed if you're certain you suffer from nematodes. Otherwise, I instead recommend manual blight-control techniques to deal with your ailing plants. I'm glad to report that our tomatoes enjoy Ohio much more than they did Virginia. I've pruned a couple of times to knock back septoria leaf spot, but our plants are still thriving despite the onset of the mildest of the trio of common tomato fungal diseases. Instead of using twine to support tomato plants we wanted to try some of this new foam tie to see if it would last multiple seasons. The reviews mention how it is also good for organizing device cords. Along with downgrading our homesteader status to weekend level has come a similar upgrade in the amount of time I get to spend in the woods. In fact, I've worked a hike into my daily schedule --- an hour or two of editing in the morning is followed by a two-mile stroll through the nearby park while I think the day's chapter out. More time in the woods means more wild mushrooms collected. 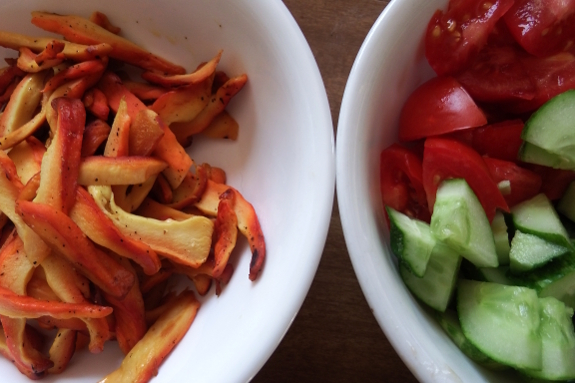 And, in the process, I've noticed that wild mushrooms taste so very different if picked at their peak flavor versus even just a few hours later. 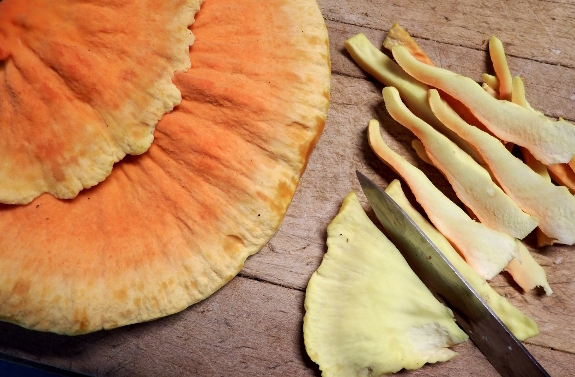 This chicken of the woods, for example, was one of the best mushrooms I've ever eaten. I'm so glad my characters recommended I take that particular path. Making a line of fence posts to support some galvanized wire for young asparagus.